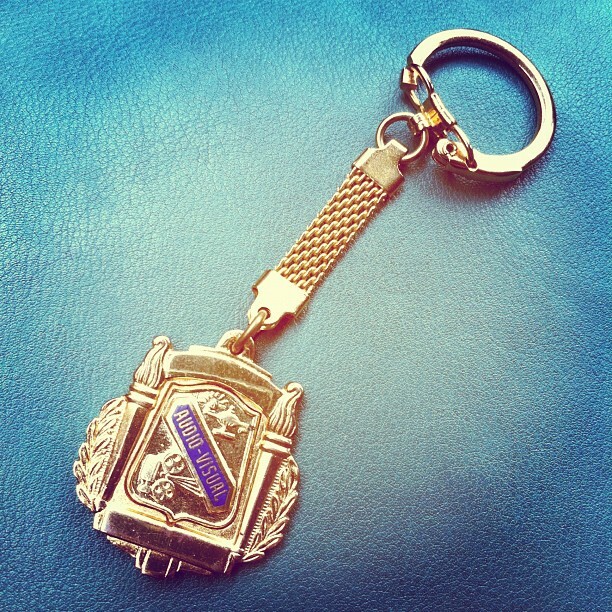 Yesterday, I scored this Mid- Century key chain with Audio- Visual fob. It's gold tone metal and blue enamel, with a movie projector on the lower corner. Condition is excellent, with very minimal losses. And keys would mar the surface, which would be a shame. While normally not one to take vintage anything apart- unless damaged beyond the point of being salvaged in some way- I can't help but think this would make a rather cheeky pendant necklace. You know, in honor of the older, cute but painfully shy guy in high school who kissed you outside of the auditorium, circa 1993. At least I seem to recall that he was in the AV Club (or the Magnet version). But that's a different story. So, fair readers, I leave it up to you. Do I list this key chain in my Men's shop (insert shameless plug here: RetroHommeVintage), or do I put the fob on a short to moderate length gold chain and smirk every single time I wear it? What's this gal to do?